Entertainment in Hawaii is reaching new scorching heights. However, discovering nightlife or unique entertainment in Hawaii or Kaua’i can be a difficult venture. If you are planning an event or vacation in Hawaii and are looking for some delightful entertainment to complement your stay, surprisingly there is some unexpectedly amazing talent on the islands. First we will introduce a company that brings “Hawaii’s hottest entertainment” to the Hawaiian Islands, the US mainland and internationally. Soul Fire Productions is an accomplished, dynamic entertainment company that has been producing events for well over a decade. Soul Fire offers an array of talent including fire dancing, hula/Tahitian dance, aerial dance, Samoan fire knife, LED/glow performances, contortionists, cirque style performers, belly dance, roving characters, body art/henna artistry, disc jockeys and more. This team of spirited women has collaborated with a variety of talent to bring cutting edge artistry to their audiences. Their goal is to continually offer the best entertainment in the Hawaiian Islands. From their unique costuming and makeup designs to their graceful yet powerful choreography and dance variety, the Soul Fire team is dedicated to bringing the most breathtaking and refined performance to any event. 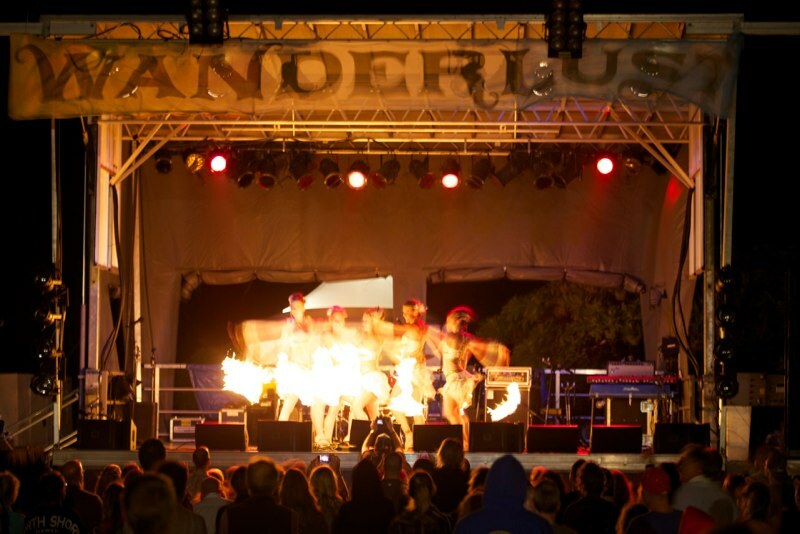 Specializing in synchronized, choreographed fire performances, dancers utilize a variety of fire modalities including poi balls, double staves, single staff, fire snakes, hula hoops, double flaming hoops, fire umbrellas, fans, torches, palm lotuses, fire blowing, fire eating and more. Dancers skillfully weave and maneuver patterns of fire within and around each other with split-second timing. As these women dance with one another, their accuracy and precision of their inter-woven partner moves is impressive. Soul Fire is available to coordinate entertainment in Hawaii for corporate events and private parties, weddings, birthdays, music and TV videos, and any featured event that requires professional entertainment. The company works with each client to artfully design events specifically to each need. Whether you’re looking to add a bit of flair to your event, or providing a totally unique experience for your guests, Soul Fire constructs their performances to consistently mesmerize their audience. In 2013, Soul Fire Productions and their executive team members presented a new and exciting show to the island of Kaua’i. The show Sekai was birthed and brought to the islands as a multi-media performance art piece. Sekai included a storyline about a young woman’s journey to discover true purpose and meaning in her life. The production incorporates all of their offered dance variety, including live Taiko drumming and musicians, unique set designs, an engaging soundtrack, talented actors and storytellers as well as stunning visual projections. The show is currently seeking a regular venue to be offered as premier entertainment in Hawaii. However, the characters from the show are also offered as roving performers to accompany any large event production in need of eye-catching allure and added ambience. As you seek for something to capture your heart and attention, these blazing beauties are sure to do the trick. The artistic professionalism radiates through each performance as audiences are continually mesmerized by their presentations. Although based in Kaua’i, these women are prepared to bring the show on the road and offer their hot illustrations anywhere in the world. Bringing a bit of island flair meets elegant goddess; your search for entertainment in Hawaii ends here.